Sawyer Valentini seems to be behaving a bit oddly. She makes sour faces at her colleagues in the cubicles at work. She rebuffs her boss' unwanted sexual innuendo with a trace of panic in her manner. And after flirting with a blind date and bringing him back to her apartment, the evening blows up when she recoils from him screaming. 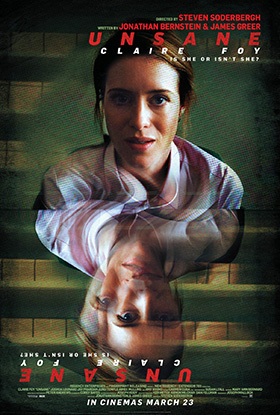 Is Sawyer (played by English actor Claire Foy) just another highly strung urbanite? Are people truly picking on her? Or, is she, in fact, Unsane? Welcome to Steven Soderbergh's 28th feature film as a director––a lean, unceasingly antsy psychosis-in-a-basket that speaks to a wide range of 21st-century fears and prejudices in a streamlined narrative that gathers speed as it proceeds. Disturbed by the direction her life is taking, Sawyer consults a psychiatrist, signs a piece of paper without really reading it, and BANG! Before she has time to process it, she is committed to a mental institution. Maybe it's her answers to the shrink's questions, or her insistence that someone is stalking her, or the fact that she has a police record of assaults and such. At first, she's outraged and then, after she settles into her bed in the open, mixed-gender ward and the reality fully sinks in, she turns combative. The doctors at the clinic shine her on, even when she summons her mother Angela (Amy Irving) to argue for her release. Sawyer is trapped, but from what we see, we're unsure whether or not it's justified. The woman in the next bed, Violet (Juno Temple), is a classic antagonistic harpy from The Snake Pit file. The attendants all exhibit that dull, sadistic, institutional temperament we recognize from countless "I'm not crazy!" scenarios. Sawyer's only ally is Nate (Jay Pharoah), an African-American man who explains the facts of life to her: "They got beds, you got insurance." Our heroine has fallen into a predatory, for-profit booby hatch that milks patients dry. When the insurance runs out, they get ejected in a hurry. One night, Sawyer sees Nate surreptitiously talking on a forbidden cell phone. Could it be he's an undercover reporter on assignment in the guise of a patient, à la Shock Corridor? What truly shocks Sawyer is an attendant called "George Shaw" (mumblecore veteran Joshua Leonard, from The Blair Witch Project), whom she believes is her longtime stalker, come to have his way with her at last. Of course, that kind of thinking is what landed her in the rubber room in the first place. The assiduous Soderbergh has been ransacking genres for years, so he's probably ready for a no-holds-barred mental-health slugfest like this one, written by Jonathan Bernstein and James Greer, the guys who gave us Bait Shop and the Jackie Chan starrer The Spy Next Door. The new film might also be Soderbergh's tribute to Samuel Fuller and One Flew Over the Cuckoo's Nest. But in its icy tone and skittish visuals (it was shot entirely on iPhone), Sawyer's ordeal—from her lab-rat-in-a-cage career at the bank to the eerie, blue-tinged nighttime forest—has the slight-yet-unmistakable whiff of The Girlfriend Experience. That film was Soderbergh's foray into Gilded Age mercantile anxiety in the person of an insecure young woman who refused to be vamped on with impunity. Someone like Sawyer. Kudos to Foy's performance and to Soderbergh's genius for finding the tenderest, most sensitive nerve ending and worrying it mercilessly.